Globalisation has changed the constraints of work and learning. As a result, the labour market expects graduates and staff of Higher Education Institutions (HEI) to be able to interact in global settings. This poses a challenge to HEI, which are expected to promote the employability of students and staff. As a response, the concept of entrepreneurial universities has developed, which seek to foster entrepreneurial development in teaching and learning. 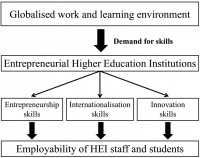 These objectives are closely linked to the educational concepts of internationalisation, entrepreneurship education, and innovation pedagogy (see Figure 1). Looking at the literature, we tried to match the necessary skills with the teaching and learning methods in Table 1. Within the “INTENSE – INTernational Entrepreneurship Skills Europe” project we aim to incorporate these elements into the curricula of HEI. The aim of INTENSE is to develop and implement a transnational teaching module on the internationalisation of small and medium-sized enterprises (SMEs) as an Open Educational Resource. A major component of our teaching approach is the transnational student consultancy. The teaching module is taught parallel at all INTENSE partners. Before or simultaneously, students receive training in international management and project management and consulting skills. These teaching materials are unified among all INTENSE partners but adopted to the curricular and demand of each partner university. You can find all the teaching material below. The consultancy project is designed for students who are in the midst or end of their bachelor studies. Here students consult a real SME in its internationalization adventure. The consultancy project is supplemented by a blended learning course. 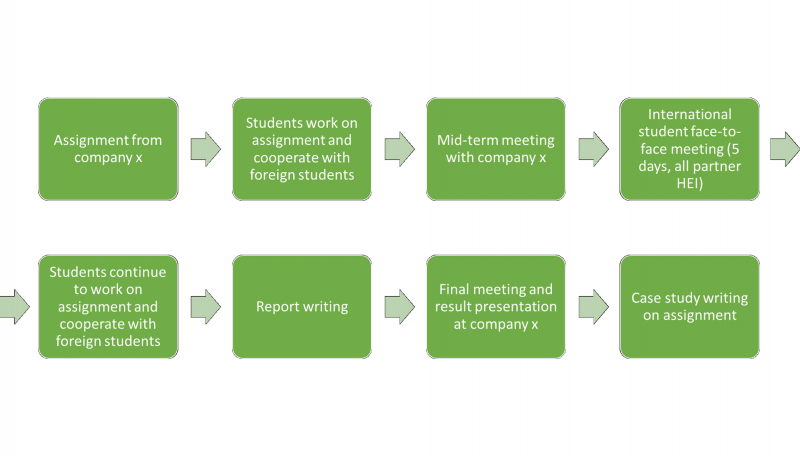 In order to enhance the students’ internationalisation skills, student teams cooperate transnationally as demonstrated in the example in Figure 2. Team A in Germany collaborated with SME A, also based in Germany. SME A wanted to internationalise to the Netherlands. Team B, based at an HEI in the Netherlands, supported team A. Team B provided Team A with relevant knowledge of the Dutch market. At the same time, Team A provided specific information on the German market to Team C. Team C is based in Finland and collaborated with the Finish SME C who sought to internationalise to Germany. The general process of teaching and organizing the consulting project can be seen in the figure below. Login here to gain access to our teaching material.